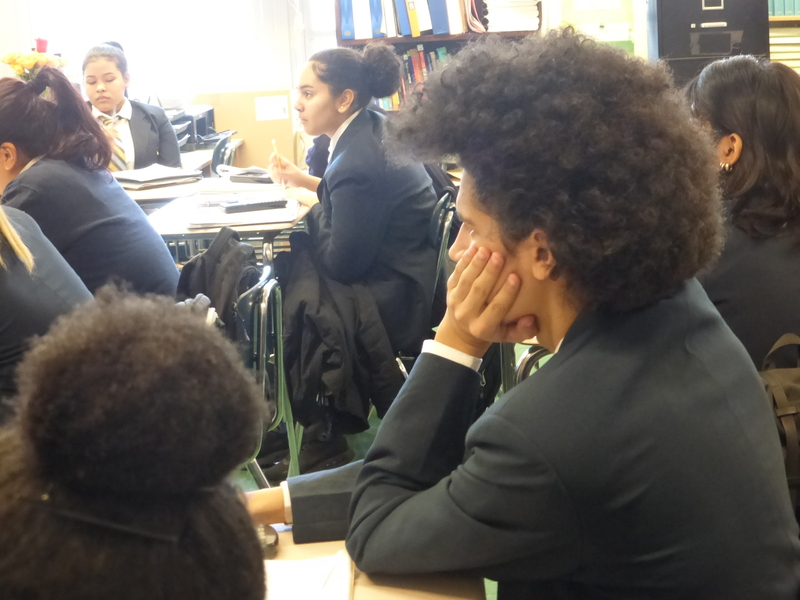 All students wear uniforms at MS/HS 223 in the South Bronx. A previous version of this story ran in November 2017. It has been updated with new information for October 2018. Here's our list of best bets for middle schools in the Bronx. Also consider schools that accept children from anywhere in the city. Applications are due December 3. Why we picked it: Strong leadership, engaging instruction and lots of enrichment opportunities in STEM; a welcoming environment. Who gets in: District 7 students. Far more applicants than seats. Why we picked it: Safe and supportive environment, nice range of activities and good at raising the achievement of those arriving with weak skills. Who gets in: District 7 students. Why we picked it: Students tackle demanding work and those who stay for high school make good progress. Why we picked it: Nurturing school with strong emphasis on research and writing. Why we picked it: Nice environment with advanced classes for top students and lots of extra help for kids who need it. Who gets in: District 8 students. Why we picked it: Solid achievement and good support for students learning English. Why we picked it: Strong instruction and an extended school day allowing for special activities such a debate team, web-design, digital arts and computer coding. Who gets in: Open to students residing in the school’s zone. Why we picked it: A community school with a solid record of achievement thanks to rigorous academics and a welcoming environment. Who gets in: Preference to kids attending Mount Eden Children’s Academy but open to District 9 and 10 students. Far more applicants than seats. Why we picked it: Modern facility and excellent debate program. Who gets in: District 9 and 10 students. Why we picked it: Strong attendance and students are well-prepared for high school. Who gets in: District 9 and 10 students. Review of students’ test scores, grades and records of attendance and punctuality. Why we picked it: A small school with steady leadership and happy teachers. Many 8th-graders earn high school credit. Who gets in: District 9 and 10 students. Review of students’ grades, academic and personal behavior, and entrance exam. Why we picked it: A nurturing school with steady leadership and strong instruction. Who gets in: District 9 and 10 students. Review of students’ test scores, grades, records of attendance and punctuality, writing assignment and interview. Why we picked it: Offers engaging instruction and imaginative classes as part of the International Baccalaureate curriculum. Why we picked it: Strong and engaging math and science instruction; most 8th-graders earn high school credit. Why we picked it: Part of a successful network of all-girl schools. Who gets in: Bronx students. Review of students’ test scores, grades, writing assignment and interview. Why we picked it: Two programs for high achievers. Who gets in: Zoned program; PACE and Spectrum honors programs open to District 9 and 10 residents; review of students’ test scores, grades and interview. Why we picked it: Strong attendance and good support for high school admissions. Who gets in: Limited space for 6th-graders new to the school. Middle school applicants should contact the school directly for information on how to apply. Why we picked it: Imaginative curriculum with strong emphasis on research and writing. Who gets in: District 9 and 10 students. Review of students’ test scores, grades and interview. Why we picked it: Strong sense of community and engaging instruction with an emphasis on S.T.E.A.M. Who gets in: District 11 students with priority to those attending PS 189 (CASA elementary). Why we picked it: A new school with strong leadership created out of the merge of two, small schools; lots of programs and support for students. Who gets in: Bronx students with priority to students zoned for the building. Why we picked it: Students are well-prepared for high school; many 8th-graders earn high school credit. Who gets in: District 12 students with priority to students zoned for the school. Why we picked it: High expectations and inspiring atmosphere; many 8th-graders earn high school credit. Who gets in: District 12 students. Why we picked it: Modern, colorful building; well-funded college office.